I rarely sweeten my tea, with a few notable exceptions (chai just doesn’t taste like chai if I don’t add some honey and milk to it). That doesn’t, however, mean I have a problem with you sweetening your tea. I’ve written before about tea absolutists (a.k.a. “tea Nazis”) and their attitudes. I hope I never become one. What does kind of bother me, however, is preparing a cup of a new and interesting tea for a guest and having them sweeten it before they taste it. For some people, though, they know how they like their particular favorite tea, and they assume that’s how they’ll like all tea. I think it indicates a general unawareness of the breadth of flavors in different varieties of tea. Back on the subject of sweetening, times are changing. Used to be, a tea bar or coffee shop could put out a bowl with some of the white packets (sugar), some of the blue packets of aspartame (NutraSweet/Equal), and some of the pink packets of saccharin (Sweet’N’Low), and everyone was happy. Expectations have gone up, though. Now, you really need to have the green packets of stevia (Truvia/PureVia), yellow packets of sucralose (Splenda), and brown packets of natural brown sugar. And perhaps a jar of honey, a jar of agave nectar, and a jar of pure maple syrup. Some want the most “natural” sweetener they can get. Others have a particular sweetener that they like the taste of. Others are primarily worried about the calories. For those who wish to experiment, I’ve been trying something a little different lately. 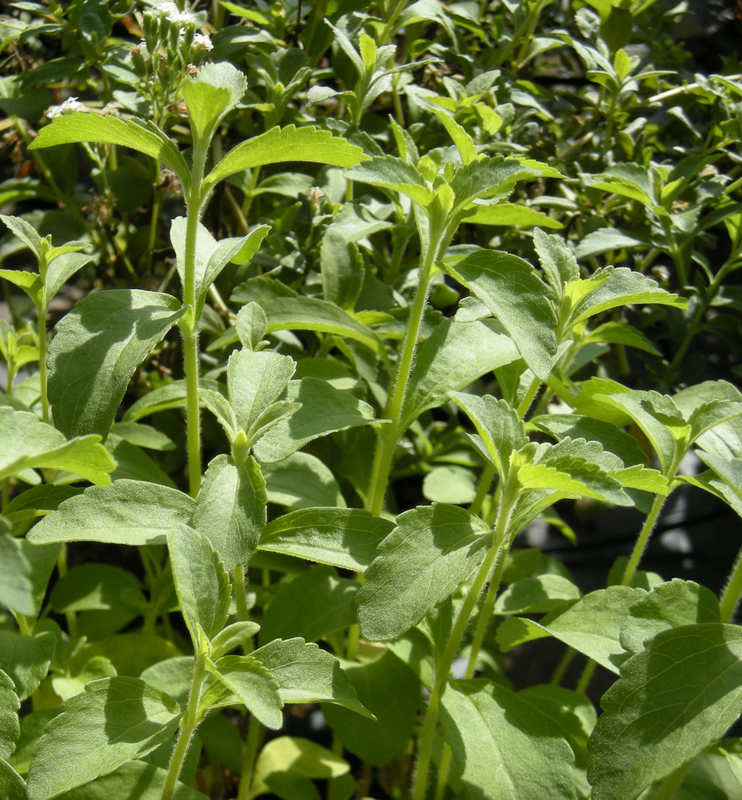 Stevia is a plant native to Paraguay that’s now being grown in a bunch of countries. It has a number of sweet components to its leaves, and the most potent (Rebaudioside A) is the base compound used to produce the powder in the green packets. That powder has a slight but noticeable flavor, which you’ll definitely pick up in a delicate tea (not that any of you would actually sweeten a delicate tea, would you?). I’m now stocking dried raw stevia leaf in the tea bar. I use it — quite sparingly — in a couple of my house blends to add a touch of sweetness, and I’m starting to get more customers asking me to drop a pinch of stevia leaf in the pot when I’m brewing their tea. The flavor from the raw leaf is different from the flavor you get from the processed powder. Is it any more “natural” than the powder? I really don’t think so. But it feels different to add some leaves to your infusion instead of stirring a powder from a packet into the finished tea. Going back to my mantra: whatever method of preparation works for you is the right one — for you. Posted on 6 August 2012, in Tea Biz, Tea Thoughts and tagged agave nectar, aspartame, blue packets, chai, Equal, green packets, honey, milk in tea, NutraSweet, pink packets, PureVia, Rebaudioside A, saccharin, Splenda, stevia, sucralose, sweet tea, Sweet'N'Low, sweetener, Truvia, yellow packets. Bookmark the permalink. 2 Comments. I generally do not sweeten my tea, and on the rare occasions where I do, I use honey. There’s another natural sweetener that I’ve discovered recently, and it’s native to Eastern North America: Anise Hyssop. It has a noticeable licorice-anise flavor, so it can be great if you like that flavor, but it is probably not a good idea otherwise. It is less sweet than Stevia but still quite sweet–more so than the subtle sweetness of spices and herbs like cinnamon or licorice. I haven’t tried Anise Hyssop, Alex, largely because I don’t like that anise flavor. We certainly are seeing a great variety of sweeteners these days, though, aren’t we?